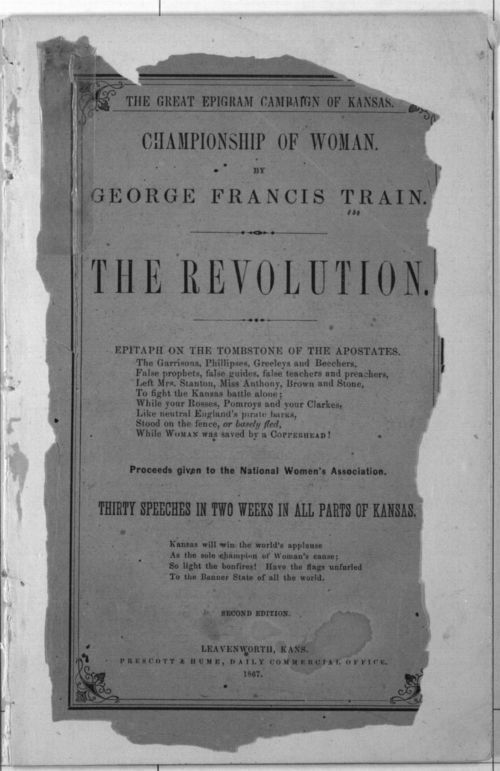 This pamphlet contains excerpts from and/or newspaper accounts of thirty speeches that George Francis Train, a supporter of women's rights, gave in Kansas over a two week period in October and November of 1867. Train came to Kansas after participating in an excursion to the Rocky Mountains with approximately 200 newspapermen to hunt buffalo. Numerous Kansas women's suffrage supporters are mentioned in the booklet. Train gave speeches in Leavenworth, Lawrence, Olathe, Paola, Ottawa, Mound City, Fort Scott, LeRoy, Humboldt, Burlington, Emporia, Junction City, Topeka, Atchison, Wyandotte, and possibly other communities. Susan B. Anthony and Elizabeth Cady Stanton were also campaigning in Kansas and shared the podium and/or communicated with Train. Train was an author, speaker, and a celebrity for his eccentricity.